Most of the data collection I do here are climate measurements. This gives me a chance to see up close how much the peninsula of Antarctica is warming. The change I can see is dramatic and one of the roles I enjoy is talking to cruise ship passengers about it. I have two links for you today. The first concerns the now imminent breakup of the Wilkens Ice Shelf. A little more on Wilkens. It is a broad area of fast sea conected to the peninsula. It's pretty young, apparently in place for several hundreds or thousands of years. 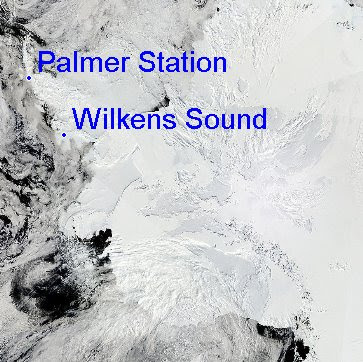 Unlike the smaller Larsen B Ice Shelf whose breakup was very publicized in 2001-2002, Wilkens isn't holding back flowing glaciers so its collapse won't increase sea level. However, its breakup will mean huge habitat loss to krill and species that on them such as Adelie penguins. Early on Larsen was identified as susceptible to breakup as temperatures increase. In 1993 Professor David Vaughan of the British Antarctic Survey predicted that the northern part of the floating plate of ice was likely to be lost within the next 30 years if climate warming continued on the peninsula at the same rate. Events on the ground have proceeded much faster than his predictions and last March disintegration began. After several events last summer, the remaining sheet of over 5000 square miles (about the size of Connecticut) is now being held to the peninsula bya bridge only 500m wide at its narrowest. Breakup of that bridge will almost certaibly happen in the next weeks or months. Meanwhile, evidence for warming of the continent itself is also piling up and that's link 2. 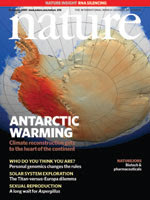 Although there is still disagreement, an article in Nature this week gives new evidence that Antarctica is warming in step with the rest of the planet, with rates ranging from +1.1 degrees F / decade on the body of the peninsula (where Palmer is located, and those are the rates we measure) to 0.2 degrees F / decade on the continent proper. The difficulty in understanding whether Antarctica is warming and how fast is mostly due to the difficulty in installing weather stations in the interior of the continent. Also, Antarctica is a complex story with a huge forces such as the Antarctic Circumpolar Current (ACC), the seasonal antarctic stratospheric vortex and the ozone hole all playing major roles in the climate of the region. Please let me know if you would like to hear more about these topics and I'd be pleased to share what I am learning. FYI, those third stage ordnance timers made it through testing, so 3/5 looks even more solid today. There are lots of gaps in my knowlege about both Antarctica and the impact of your studies...for example, what is "antarctic stratospheric vortex"? So yes, feel free to educate me! Tim - okay, thanks for keeping me in the loop. I'm excited for you guys and sure I'll enjoy the launch from NASA tv (gotta figure out how to get that). Only a small groan here. Hi Loui!!!! Please send me an email. I need to get in touch with you. Drawn to this poetically beautiful but rapidly warming part of the world, I am taking a leave of absence from my usual job at NASA's Jet Propulsion Laboratory to work for the US Antarctic Program. My blog records my observations about antarctic science and my daily life. My jobs here are the research associate, ocean search & rescue team member and fire marshal. I welcome question and interaction so please feel free to contact me or just follow along !